She played in Walter Perez‘s Into The Night as Francie. Sofia Kaempfe: I’m Sofia Kaempfe. I’m an actress and a student. I also love to watch movies, tell stories, draw and care for animals. I have two younger sisters, a dog named Brodie and three rabbits. I truly love animals. Sofia Kaempfe: I knew I wanted to be an actress when I was eight years old. I have always been fascinated by movies and television and I love getting into character. Sofia Kaempfe: I was on set when my manager called me to tell me that I was selected for the role of Francie. I was incredibly excited! I had to hold in my squeals though because I was on a quiet set. That was really hard. Sofia Kaempfe: I think what attracts people do this story is that mystery of the lost little girl. Sofia Kaempfe: I audition for the role of Francie. Sofia Kaempfe: Working with Walter Perez super fun because he is fantastic with kids, has a lot of enthusiasm and is a very nice guy. Sofia Kaempfe: I loved when Walter jumped on set with me and pretended to be a vampire with me. Sofia Kaempfe: Walter Perez, Aly Trasher and I all stay connected on Instagram. 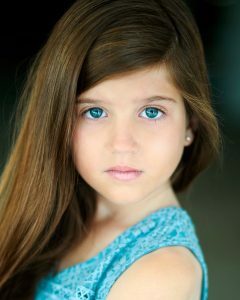 Sofia Kaempfe: I just went to the red carpet premier for my last short film Famous Little Girls. I also received a best supporting actress award for my role in that film as Simon de Beauvoir, so it was very exciting! Sofia Kaempfe: I love scary books and movies, but my mom won’t let me read Steven King’s scary books yet. As soon as she does, It, The Dark Half and Pet Cemetery are at the top of my list! Sofia Kaempfe: I think people would be surprised to find out that my favorite animal is an alligator lizard. They will eat right out of your hand and can have live babies. Sofia Kaempfe: Thank you for taking the time to read this. I know you’ll love the movie!